For the past two months I've had something on the calendar for today. Local historian Geoff Mead, who I've attempted to make famous in a total of four Kemptown Rag articles (the most recent being page 5 of this issue, which features a line I shamelessly stole from Dave without his consent - that'll teach him to comment on this blog), is leading a five mile walk to Plumpton Plain this morning. That's the front door of the £200,000 patio-level flat you can see there. 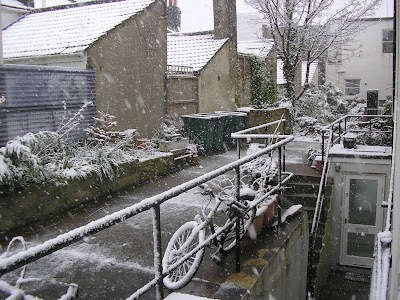 Anyhoo, call me insane, but the thought of walking halfway to Lewes, uphill, in a snowstorm doesn't really appeal to me, so I'm staying in. I'll go next year instead. Possibly with a pram. I'd say she was being a bit premature, but Lisa's already bought the Supernanny book, my parents have given me 'The Sixty Minute Father', and my Dad was measuring prams back in February. So frankly she's left it a bit late. She should learn from my parents, who are only too well aware that if you want me to get through a book which is designed to be read in an hour, you need to give me a good eight months. Anyway, bearing in mind that my neighbours are inclined to bang on the ceiling if I make Lisa laugh after 10pm, it's probably just as well to have a book of advice on crying babies. If all else fails, I can use it to beat the child unconscious. Lisa's already read a couple of chapters, while I've flicked through the index, looking for a chapter on partying Poles, which are the main cause of my sleep problems. All of which are dances I've done at weddings. I know more about babies than I thought.